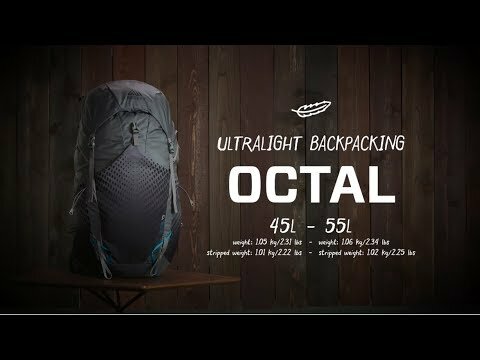 For gram-obsessed hikers who hanker after a comfortable pack, the Octal 55 isn't quite as light as a garage-made cuben fiber model, but it's definitely on the light side for a pack with comfortable suspension. 55L capacity suits thru-hikers going long stretches between resupply points or crossing high-elevation passes, carrying cold-weather gear. Its max recommended load of 16kg, means you'll have put lightweight gear inside it, but the big thing to know is it weighs just over 1kg! Plus you can strip off the rain cover and lid to take it down just a few more grams. Aerospan suspension uses a tensioned 7001 aluminum perimeter frame with an anti-barrelling support for comfortable carrying. Women's specific harness, hipbelt and lumbar pad use body-mapped EVA foam with more padding in key areas to reduce pressure points and less in others to save weight. Shallow depth trampoline style back panel lets air flow around your back. All body contact surfaces use moisture wicking fabrics to keep you cool and dry. Access the large main compartment via a one-handed drawstring closure. Floating top lid with 2 pockets is removable. Swap it out for the included minimalist weather proof lid, or go lidless in nice weather. Large stretch front pocket is perfect for on-the-go gear or segregating a wet tent fly. Stretch side pockets can be loaded from the side to access water bottles while you hike or from the top to carry sandals or tent poles. Zipper hip belt pockets keep snacks or your phone easy to grab. Loop on the shoulder strap holds your sunglasses, 2 on the back hold your trekking poles or ice axe. Low-profile, zig-zag compression straps on the sides and bottom compress the load or let you lash on extra gear. Hydration compatible with interior sleeve, port and loops to hold your hose. Reservoir sold separately. Includes a lightweight custom-fitted rain cover.